We’d love your help. Let us know what’s wrong with this preview of 1000 Words by Stephanie Bibb. 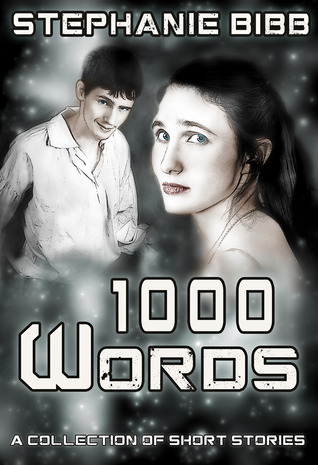 "1000 Words" is a collection of ten short stories, each approximately one thousand words in length. They range from science fiction and fantasy, to adventure and horror. Each short story is accompanied by its own book cover. This was a capstone project meant to merge photographic illustration with creative writing. *A space traveler wakes up with "1000 Words" is a collection of ten short stories, each approximately one thousand words in length. They range from science fiction and fantasy, to adventure and horror. Each short story is accompanied by its own book cover. This was a capstone project meant to merge photographic illustration with creative writing. *A space traveler wakes up with no memory of yesterday's events, and sits down to read the ebook she finds on her bedstand. *When a young girl gets transported to the future, she becomes single-handly responsible for a plague that could wipe out Earth's population. *A young witch ventures outside of her town for the first time in hopes of transferring her brother's illness to a willing creature. *A young hunter defends herself against an intelligent cougar stalking her family's village. *A father's actions run full-circle when he chooses to cut educational funding. *A man's choices lead him to four red lights in the middle of nowhere, where he is haunted by a ghost of his past. *A magician's reenactments of his past come to a halt when his sister shows up onstage. To ask other readers questions about 1000 Words, please sign up. My name is Stephanie Flint, formerly Stephanie Bibb. (You can find the 1000 Word short stories under both names). I primarily write science fiction and fantasy, and I also do book cover design-- which is the main thing my blog focuses on. My 1000 Words short story project encompasses both fields of interest-- I wrote ten 1000-word stories and created book covers for them to start my portfolio. Right My name is Stephanie Flint, formerly Stephanie Bibb. (You can find the 1000 Word short stories under both names). I primarily write science fiction and fantasy, and I also do book cover design-- which is the main thing my blog focuses on. I saw another profile sharing how they rate books on Goodreads, and decided to do the same. I like reviewing the books I finish reading and saying what I liked or didn't like about them, but I want to clarify how I rate books. I base the rating off of the Goodreads scale, and I rate higher or lower on how I personally enjoyed the book in order to have a better chance of finding similar books I'll enjoy per the Goodreads recommendations list. 5 Stars - I absolutely adored this book. It was exactly what I wanted to read, it kept my attention, and I'll definitly think back to this book again and may eventually reread it. 4 Stars - I enjoyed this book. Every once in a while I'll probably reread select passages. 3 Stars - I liked the book. It wasn't bad, but I'm not as enthusiastic about this book as others. 2 Stars - This book is okay. I enjoyed reading the story, but it didn't quite resonate with me the way other stories do. It has its drawbacks that kept me from fully enjoying the story, but other readers will probably enjoy this more than I did.